Lexi: Please welcome debut author Cindy Tomamichel! What are you most excited about in this new release? 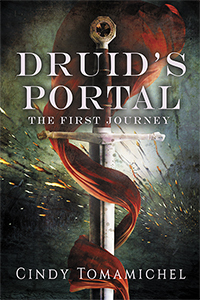 Cindy: Druid’s Portal is my first published novel, so it has been an amazing rollercoaster of learning so many new things. I have also met so many great new author friends in the whole process, which was an unexpected bonus. Cindy: I am a long time reader of boy’s own adventure stories, with authors such as RE Howard (Conan), Henry Rider Haggard and Edgar Rice Burroughs. I also love sci fi, such as Robert Heinlein, Harry Harrison and Andre Norton for creating worlds of pure imagination. I also enjoy high action modern authors such as Peter O’Donnell (Modesty Blaise) and Andy McDermott. Lexi: Now that you have this first one under your belt, what are you working on now? Cindy: The second in the series of Druid’s Portal, as well as doing some editing on some other novels in the hopes of getting them published. Oh, and some short stories for some upcoming anthology collections. Cindy: I prefer a fantasy element to my writing, and time travel can provide that if you use – as I did- a magical pendant, and involved ancient goddesses as well. I also enjoy the contrast with actual facts and a twist of fantasy, and you can see it through the eyes of a modern day heroine. Cindy: The quote ‘Writer’s write’ I believe is a good one. Just sit down and do it. Don’t get sucked into the hype of the writer’s lifestyle, or talking about what you could be writing, or pretending research is writing. There must be words on the page. Lexi: How long did it take you to write your most recent release? Why? Cindy: I write many of my novels during Nano- Write a Novel in November – so the first draft takes me November and half of December to finish. However, Druid’s Portal took longer as it wasn’t a Nano, and I had a mix of dream sequences, flashbacks and time travel. It was terribly hard to sort out so it made sense. So Druid’s Portal took over a year, and I learnt many lessons about my own writing and editing during that time. Be sure to check out the blurb and short excerpt of Cindy's debut novel! 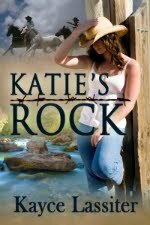 In the shadow of Hadrian’s Wall and 2,000 years back in time, Janet’s past and present collide. Daman has vowed to drive the invaders from the shores of Britain, and march his barbarian hordes to Rome. Trajan swears vengeance against the man who threatens both his loves - Janet and the Empire. Time is running out - for everyone. Danger. Around her the grey void echoed with screams of hatred and of death that pounded in her ears. She was in a battlefield, surrounded by the misty shapes of men as they bellowed in agony, and she choked as the smell of blood smothered her. A tall shadow filled her vision. Right in front of her a shadowy figure raised a sword, and she cried out and fell to her knees. The grey void vanished, and Janet opened her eyes. She shook her head. 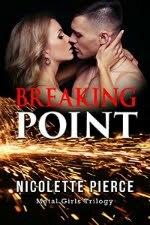 It had been the impression of a moment, but death, danger, and love seemed intertwined in a way she could neither explain nor fathom. Thank you Lexi, that looks lovely. Happy to answer questions from readers!